on verso signed twice, titled in French and English, dated 1966 and inscribed "Montreal"
Charles Gagnon stated, “The real content of a painting has nothing to do with what appears to be the painting…It’s whatever comes out of the process (of painting) which is important…The quality that transcends what we think life is, you know – what is left when nothing is left.” Sonde vert étape 2 - Feeler Green Stage 2 seems to be an exact translation of this thought. Three squares, open on the left side, are seemingly boxed one within the other: a green one, a pale grey one and finally a white one. The white one is painted flat and neutral, as if to make the transition between the painting and the wall. The main event seems to be the pale grey square, which represents “what is left when nothing is left.” Paradoxically, this large expanse is rather soothing to look at, not at all cold or detached, but warm and open. In Gagnon’s painting, a void is never empty. It is always the place of enhanced consciousness, of meditation, if you want. Sometimes he felt the need to write something on it, such as “seuls les éternuements sont éternals - only the sneezes are eternal.” But most of the time, as in this work, they are without text. Then there is the green square that brings us back to reality. It is the colour of a lawn in front of a house, a reminder that Gagnon has always been a keen photographer of suburbia. It is important that one does not lose contact with reality at the very moment when one is tempted by transcendence. So in the middle of contemplation, a “feeler” is sent out to check if you are still with us. This green square has one more significance. It reminds us of Willem de Kooning’s green, so a “feeler” is also sent into the world of painting, which is, after all, the first reality of the painter, and in the case of Gagnon, a clear indication of his exclusively American training. Gagnon used to say that along with Jacques Hurtubise, Peter Daglish and Henry Saxe, he was a member of the New York School of Montreal. No such school ever existed, of course, as the very diversity of these painters demonstrates. But it is true that they were all in New York for a reasonable amount of time when young artists Robert Rauschenberg and Jasper Johns were detaching themselves from Abstract Expressionism. It is not an exaggeration to say that, within this group, Gagnon was the one most in tune with the New York scene at the time. 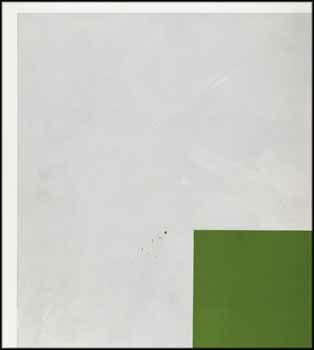 The hard-edge quality, the flatness, the frontality of Sonde vert étape 2 – Feeler Green Stage 2 refers to New York painting of the sixties, or to what Clement Greenberg used to call "American-type painting." However, then one thinks of Elsworth Kelly, who created abstract images from figuration, and one quickly dismisses this easy reference. Geometry in Gagnon’s paintings does not come from simplified nature. What is at work in his painting is rather a reflection of his photography practice and a certain taste for Zen Buddhism; as Gagnon stated, “To me, the most interesting thing about Zen was the idea of the void,” a unique kind of sensibility. From Montreal, it was indeed possible for Gagnon to look at New York with a certain ironic stance.